When's the last time your textbook made you laugh? That's what we thought. It's up to your dorm stuff to prompt a few jeers, and funny dorm tin signs are the perfect college supplies for that purpose. 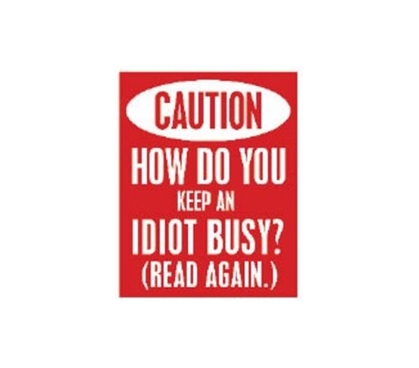 So add this Idiot Busy - Tin Sign to your dorm room wall decor if you want to have some laughs while in college. OK, so you and your friends might not be rolling on the floor laughing, but it will inspire some smiles! You'll definitely need plenty of dorm essentials to make that bare room livable, as you'll have only a bedframe and old mattress that seriously needs a good college comforter and twin XL topper on it to make it sleep-able. Sleeping on that mattress without dorm bedding is really the only joke that room will initially provide. So, stock up on some funny dorm decor items to have some fun while in college!